The ultimate gift for newly married or engaged couples, Two in the Kitchen features a modern design, sprightly illustrations, lush photography, and 150 recipes for every occasion—from breakfast and brunch to cocktail hour to weeknight dinners for two to dinner parties to holidays. 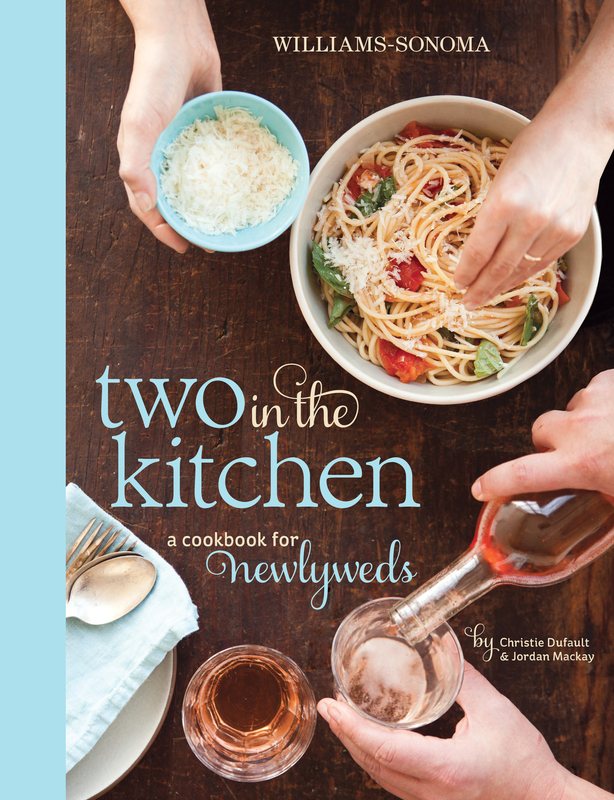 With an elegant design, colorful illustrations, gorgeous photography, and a charismatic young couple, Jordan Mackay and Christie Dufault, writing friendly and helpful text, this title looks and feels like a gift and is filled with classic recipes and resonant information for modern newlyweds. Jordan and Christie draw on their experience—he’s a wine and spirits writer and she’s a sommelier and instructor at the CIA in Greystone—to add contemporary topics to the mix, such as a focus on drinks, how to set up a home bar, how to cook happily with your spouse and entertain family and friends. Additionally, five other couples from spanning the country share their secrets and tips for achieving kitchen bliss. Besides a diverse array of 150 recipes for every occasion and taste, each chapter opens with a handful of prose recipes offering inspirational ideas for quick dishes—from smoothies and scrambles to crostini and sparkling drinks—speaking to novice cooks looking for fresh and easy recipes. Practical advice like how to sharpen knives, take care of cutting boards, and store food in the freezer, and fun ideas like creating a music playlist for a dinner party are presented in short, easy-to-read sidebars throughout the front of the book. From dozens of recipes for every occasion to advice and entertaining know-how from couples who cook, this book will lead the way to happiness in the kitchen. Real couples Six couples from across America share their tricks, first-hand experience, and knowledge gained cooking together. Kitchen advice Includes practical information, from kitchen planning and equipment to stocking the pantry and buying wineglasses. Go-to recipes From breakfast and brunch to cocktail hour and weeknight dinners, a collection of recipes ideal for newlyweds.